With the festival season almost in full flow we wanted to pick out 3 looks that we think would work perfectly at a festival this summer. 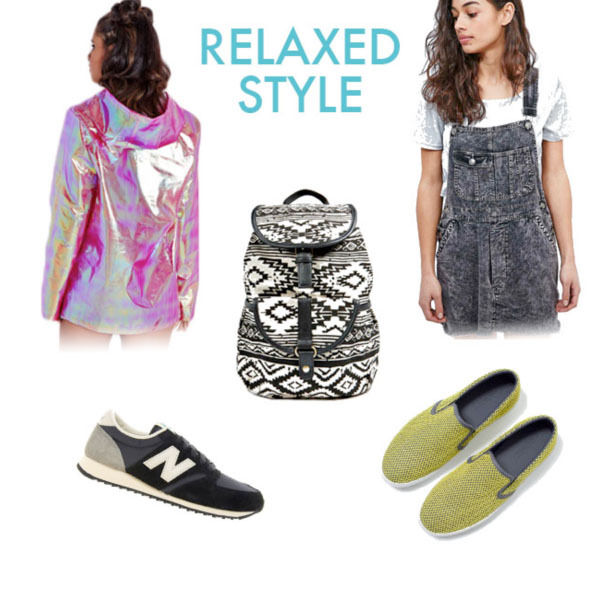 So whatever type of festival you’re heading to this year, whether its in the UK or somewhere further afield, we hope you can take some inspiration from these 3 looks. Excuse the slightly cliché title, but this best sums up the vibe of this particular look. We love this laidback look for a festival, as it incorporates popular trends of this season such as the 70’s inspired scalloped skirt from ASOS and the fringing detailing on this small messenger Zara bag. This elephant print co-ord from ASOS is the perfect outfit for a festival abroad as it is loose fitting and comfortable and will look great paired with these leather lace-up sandals also from ASOS. This look could be jazzed up with lots of layered gold jewellery and this arm cuff from H&M or paired with some wellies if the weather takes a turn for the worst. Festivals can be incredibly tiring the combination of lots of standing up, jumping around, queuing for the portaloos etc can take its toll, so comfort is really important if you are in it for the long-haul. We love this look because it is relaxed with a sporty edge that doesn’t compromise on style. Dungarees are really popular this season and this dungaree dress from Urban Outfitters in grey acid wash is a perfect nod to the trend. If you’re heading to a festival in the UK, it would be wise to bring a waterproof jacket because you never know when the heavens may open, this holographic rain jacket from Missguided is a great staple item for your festival checklist. A great pair of trainers or plimsolls are a trendy staple to bring with you, this pair from New Balance are super comfy and we couldn’t resist these Zara plimsolls for the neon mesh detailing. Lastly, a good rucksack is essential for carrying around all your essentials with you on the day, this Boohoo Aztec rucksack can hold a load of stuff and its really reasonably priced. This look reflects a more polished look, even if you haven’t showered and haven’t seen a hair straightener in days, you can still maintain the illusion of glamour and style. A patterned dress is great for a laidback look, this cutout dress from Urban Outfitters and this embroidered tunic from Zara are a couple of our favourites available. They would look great paired with these ASOS tan fringed boots and a pair of raybans. For the best festival fashion we recommend checking out Missguided, ASOS, Topshop and Urban Outfitters for some of the best festival fashion we’ve found.